Rufus finally figured out what "one strike you're out" means. 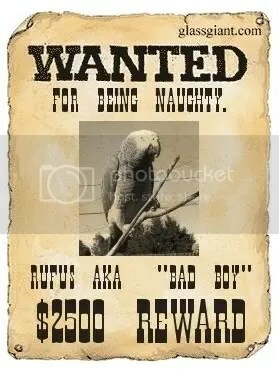 I wrote earlier about how my parrot Rufus would rather be naughty for one minute than be with his mom and dad all evening. He liked to climb off his perch and go where no bird should go. He knows where he’s forbidden to go, so there where he makes a beeline to. We would put him back in his house in the next room after three chances, then we changed it to one chance since he was incorrigible. It seemed like he was happier in his house. He would be put in there and start singing and doing his favorite sound effects. Well, he finally decided it is better to be with mom and dad all evening than be naughty for one minute, after all. We bring both greys in to watch TV or movies with us in the evening. Now, Rufus is happy to sit on his perch and play and tear stuff up. He prefers to tear up doorways, cupboards, couches, carpets, but he is switching his desires to yogurt cups. When I finish a yogurt he grabs it from me and happily throws bits all over the living room.